Marcus Smart is one of Boston's most polarizing athletes. As one of the NBA's fiercest backcourt defenders, “The Cobra” relentlessly harasses opposing ball handlers and capably defends four (sometimes all five) positions utilizing physicality, high energy, and sheer determination. But with career averages of just 9.2 points per game on 36% shooting, the 6'4" combo guard notoriously struggled with shot selection through his first four NBA seasons. Regardless, Smart's pedestrian scoring numbers were rightfully overlooked by Danny Ainge when the Celtics inked him to a four-year, $52 million deal in July. Brad Stevens has now doubled down on the organization’s investment in the tenacious defender by inserting Smart into his starting unit. The benefits have been crystal clear. 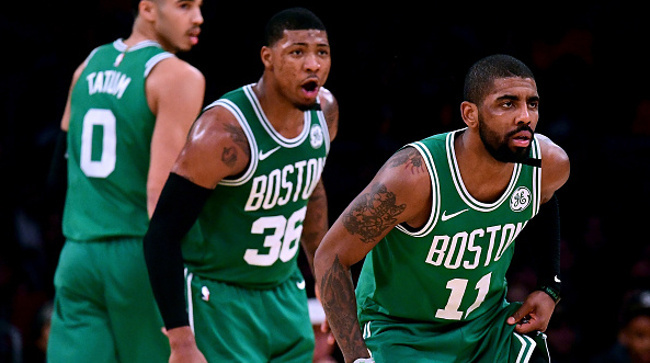 After starting the season 10-10, the Celtics have surged to three straight wins with Smart starting, outscoring their opponents 370-311 during the streak. This average scoring margin (123.3 - 103.7) is significantly better than the average margin (106.3 - 104.2) over their first 20 games with Smart coming off the bench. More importantly, the entire team is playing with increased focus and consistent aggression. All four accompanying Celtics starters have scored in double-digits in each of Smart’s starts. Smart exhibits a strong rapport with All-Stars Kyrie Irving and Al Horford, frequently facilitating quality looks while alleviating some of Irving’s point guard duties. Irving and Horford both rank in the NBA's top-20 in catch-and-shoot field goals this season, converting more than two per game as of December 4. The career-high catch-and-shoot numbers for Irving have also come on 45.7% shooting, whereas last season he converted 1.5 catch-and-shoot field goals per game at a 41.5% clip. Many of Smart’s contributions don't show up in the box score, but he consistently makes a positive impact in important situations. Seven of Boston’s nine best five-man lineups feature Smart, per Basketball Reference. 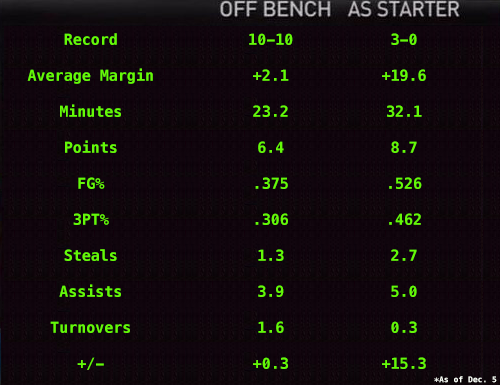 Furthermore, his average plus/minus as a starter (+15.3) is significantly better than off the bench (+0.3). His field goal percentage improves to .526 as a starter (.462 from 3PT range) versus .375 off the bench (.306 from 3PT range). And he averages 5.0 assists and 2.7 steals per game as a starter compared to 3.9 assists and 1.3 steals off the bench. Perhaps most impressive, his turnover numbers as a starter have dropped to 0.3 per game versus 1.6 off the bench, despite playing more minutes when he starts. Smart could soon return to the second unit to accommodate the elite offensive potential of Jaylen Brown and Gordon Hayward. Brown missed the last three games with back spasms, so Smart's role will continue to fluctuate. "The problem with starting Marcus Smart is you can’t bring his energy off the bench. He’s a valuable guy in both of those areas for the same reason." Smart is arguably best suited for a sixth man role with the Celtics because his two-way versatility and explosive playmaking ability allow him to impact games immediately upon checking into any situation. Additionally, Hayward and Brown are simply too talented not to start. They will displace Smart as soon as they prove to Stevens that they can open games with comparable intensity. Hayward has struggled to regain his footing after last year’s horrific ankle injury, but he impressed the basketball world on Saturday night with one of the best statistical performances in NBA history for a player off the bench. Hayward’s 30-9-8 outburst reportedly came on the heels of a scuffle with Smart during practice when physical defense and several hard fouls resulted in a red-faced Hayward becoming enraged. But instead of losing his composure, Hayward responded to Smart's ferocity by using his own strength and size to throw down some of his most thunderous dunks since the injury. "Any time Smartie gets tangled up with somebody, it's good. I've been waiting to see that side of (Hayward) for a little bit now." When one of the NBA’s most aggressive players dives for loose balls and causes chaos for opponents from the opening possession, it sets the tone and pace for the entire game. It is no surprise the Celtics look better with Smart playing more minutes because he pushes his teammates to become great. The Big Three led the way to Boston’s 17th championship in 2008, but anybody who followed the team knows that Tony Allen’s defense was a foundational element of its success. Smart is in a similar situation this year. Eventually, he will be relegated back to the bench in favor of elite talent. But no player represents the heart and driving force of a city’s collective basketball identity more than Smart does in Boston. Playing with a massive chip on his shoulder, Smart does anything it takes to help his Celtics win. Someday soon, that fiery mentality may prove instrumental in bringing home Banner 18.